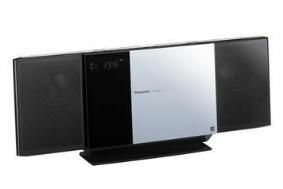 Panasonic introduces five micro hi-fi systems | What Hi-Fi? The full range comprises: SC-HC55 (£249), SC-HC35 (£199), SC-HC25 (£149), SC-HC15 (£99), SC-HC05 (£tbc). A stainless speaker mesh on the SC-HC35/HC05 and a mirror coating mesh on the SC- HC55 allow the speaker units to be partially visible. The SC-HC55 features a touch-free sensor door, with a motion sensor enabling the sliding door to open and close by simply passing a hand over it. A universal dock for iPod/iPhone built into the centre of the SC-HC05 opens outward with the push-open button, while remaining concealed inside when not in use. The iPod/iPhone docks on all five models use a direct digital connection between the portable player and the hi-fi system, allowing the latter to do the digital-to-analogue conversion for better sound quality. And if you want wireless connectivity, the SC-HC55/05 has built-in Bluetooth capability.